GROSSMONT COLLEGE – At the start of each semester, students face impacted classes, scheduling conflicts and other woes. At the forefront of these issues is the first one students face upon arriving on campus. The parking issue. However, by this time of the semester, the parking situation has seemed to ease. What happened? “Life happens,” responds Tim Flood, vice president of administrative services and director of campus facilities operations and maintenance. In a taped interview, he noted that some students drop courses, or withdraw from school to take jobs, as a semester progresses. As they do so, parking spots all over the campus are freed up. However, he said, parking troubles will occur again during the semester when a new concurrent 8-week session gets underway. New students will stay on campus all day, trying to crash courses for which they could not pre-enroll. Many also will wait in lines trying to obtain financial aid. Eventually, their paperwork will be completed and their schedules will be settled, no longer necessitating them to stay on campus as long. As a result, parking spots will turn over more often. The good news for all students, Flood said, is that the area of the campus now housing a modular village for administrators and staff will once again be turned into a parking lot “somewhere late in the spring semester” after the new administration building and student center are completed. To hear excerpts of the interview on parking with Tim Flood, please click: Flood on Parking. GROSSMONT COLLEGE –Walking around the campus can bring you into contact with many interesting people. Recently, I had a chance to learn a little about three of them. Joshua Ricks, who is taking a critical thinking class on campus, has been working on a drive to help the Boys and Girls Club. He seeks old clothes, canned food, shoes, toys, and anything else that can be used to help kids from impoverished families. He’ll be out on the Main Quad on Wednesday, Sept. 28, from 9 a.m. to 7 p.m in the quad collecting donations for the boys and girls at the Boys and Girls Club. GROSSMONT COLLEGE—When it comes time to transfer, where will students go? That is a question that Grossmont officials recommend that students ask themselves long before they are ready to transfer. The Transfer Center on campus was established to help in this process. According to Mary Rider, university transfer coordinator at Grossmont, the Transfer Center has racks filled with specialized information for transfer questions. If a student is uncertain about the process to follow, center staff can provide information that would be hard to get at a 30-minute meeting with the Counseling office. For the current semester, many students were denied entrance to SDSU because they had problems in their supplementary application process. Rider said 90% of Grossmont students didn’t attend an application workshop sponsored by the Transfer Center at which such problems could have been anticipated and resolved. 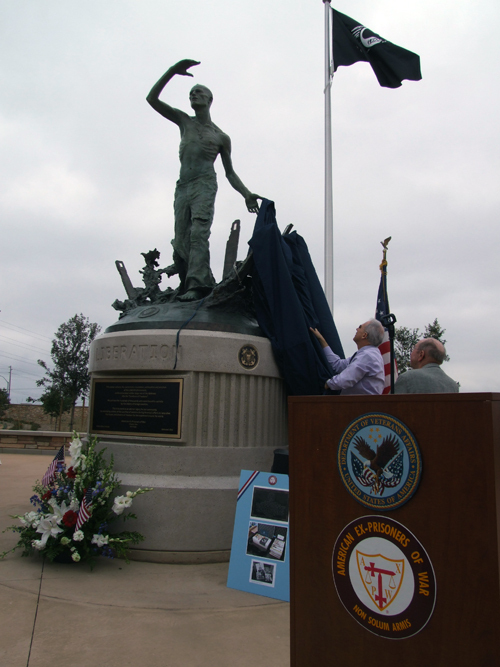 SAN DIEGO–On Friday Sept. 16, I had the honor, privilege and pleasure of attending the unveiling of the Prisoner of War (POW) statue, “Liberation Moment,” at the Miramar National Cemetery. I wish more Americans were aware of the sacrifice made by all US military service personnel, especially our POWs, and make known that we stand behind both our POWs and all our soldiers, no matter the situation. I grew up wanting to be in the Marine Corps since I was seven-years-old, and after listening to what World War II vets had to say and I was enraged at their Japanese and German captors for not following the international code of conduct for captured prisoners of war. People at the ceremony expressed a gamut of emotions, ranging from overwhelmed, to excited and happy, to enraged and angry. Most were excited and happy that our POWs have received recognition for their valor in service overseas. The ceremony was overwhelming to me, being that it was my first time ever attending something like it. I was very happy to sit down and talk with any and all of the vets who attended. They had endured pure agony and hell, all because they were fighting for the freedom of the United States of America. Honor, valor and heroism were shown by each and every one of those vets, and I can’t leave out our current soldiers fighting overseas right now. I would like to give a big “OORAH!” for all our soldiers and vets who have ever served. Thank you for your service and God Bless the U.S.A!